We all know that cinemagraphs bring static content to life on the web and social media. But did you know that the cinemagraphs you create with Flixel apps can also liven up a boring old Keynote presentation? Learn how you can share cinemagraphs on Keynote in a few simple steps. When you've completed your cinemagraph click Export and choose H.264 (MP4). 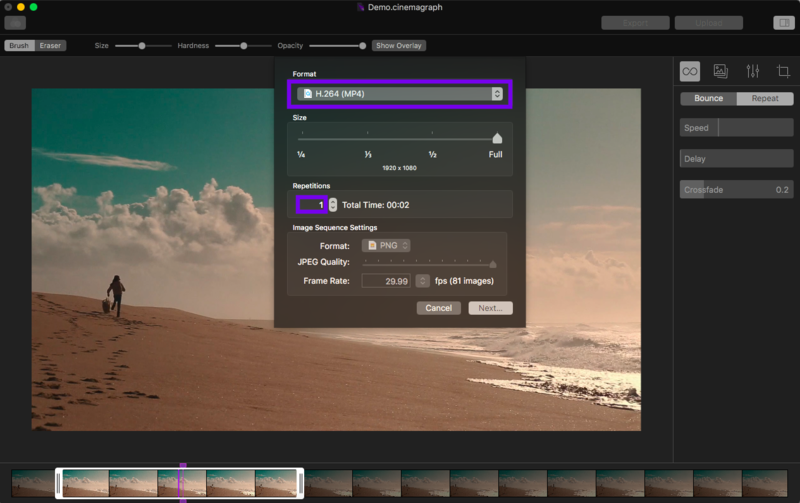 You'll only need a single loop of your cinemagraph so don't increase the number of repetitions; this will help keep the file size of the cinemagraph small. If you plan on using the cinemagraph as a full-screen image, export the cinemagraph at full size. Otherwise, you can reduce it to 1/2 or smaller. Keynote makes using cinemagraph videos even easier than PowerPoint. Go to the slide you want to add your cinemagraph video to. You can either drag your MP4 onto the slide or insert from the menu. With your cinemagraph video on the slide, select the Movie panel on the right side of the screen. Go to the Repeat section at the bottom and select Loop. Make sure Start movie on click is unchecked.